Nina misses her grandmother, who died a year ago, and she misses the way her family and her neighborhood used to be. Her parents - both lawyers - are immersed in a challenging case and don't have a lot of time. Her older brother is usually away. Her neighbors don't really talk to each other, and things with her long-time best friend Jorie have been weird - Jorie spends the summer scheming for a homecoming date with the boy across the cul-de-sac, and Nina isn't sure how to feel about that. One way or another, she decides to make a difference. She will do a good deed - 65 good deeds, in fact. Even if nobody ever knows it's her, Nina decides she wants to be somebody who is a positive force in the world. This book is pretty predictable. It doesn't raise any new ideas about issues that most people haven't thought about before. It's still worth a look, though - not every book is trying to win a Newbery Award. Nina is a good character, because she takes her own initiative to do some nice things, even though some of them are really small. She is also involved in a first-romance triangle with her long-time friend and her neighbor, but Nina is a good role model; she has honest feelings of hurt and jealousy, and she still keeps up with her own life and interests. There are some references to teenage drinking (not in a positive way, and not by the protagonists), and some mild romance. Although the characters are about to enter high school, this would be an appropriate book for most sixth grade readers. 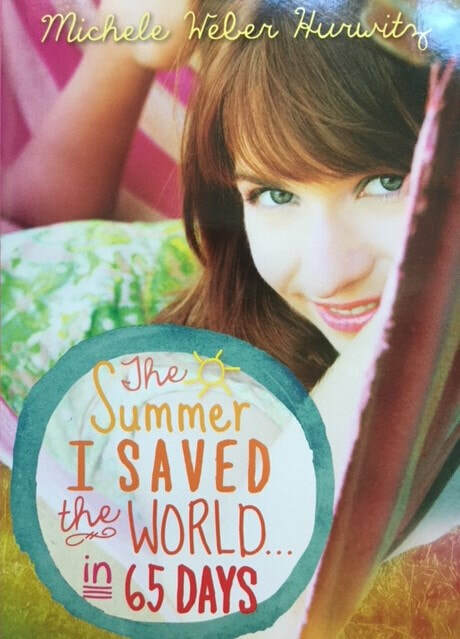 "The Summer I Saved the World quote"